Happy Thursday! 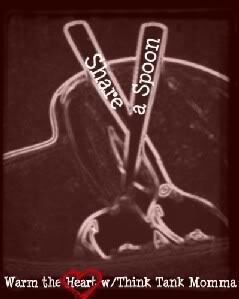 It's time once again to Share A Spoon with Momma B! This week's theme is PASTA! I know everyone has a fave pasta dish to share! So type it up and link it up! I wanna know what you're eating! Cook noodles according to directions on the box. Brown off Italian sausage and ground turkey. Drain grease and season to taste. Combine noodles, meat, and sauce. Pour mixture into 9x13 baking dish and cover with cheese. Baked until cheese is all melty and bubbly, browning on the edges! Let set for a few minutes once you remove it from oven so it is easily cut and served. We top it with fresh grated parmesan. Serve with your favorite Italian accompaniments. Yes, I made this on Tuesday. No, I didn't take pictures. Deal! My monsters love baked pastas too. Something about that ooey gooey cheese!! I know the Hubs would love this! I wonder if I could make it with fat free cheese...? Then maybe I could have some. I don't even know what mostaccoli is. I am very special. Sounds extremely yummy! One thing I love about the fall/winter is that I get back to doing some real cooking! THIS one is on my list of "to do" dishes! I love baked mostaccioli so much! I tried it at The Olive Garden for the first time and now I'm hooked! Thanks for the recipe.